You can save 20 to 50% off retail price buying Scratch and Dent appliances at the St. Louis Appliance Outlet scratch and dent appliance stores in St. Louis. These are New units that have been dented, scratched or banged in the factory, warehouse or during shipping. In many cases the damage is impossible to see and often damage is hidden after the final installation in your home. Our scratch and dent appliance prices beat the big box stores – Home Depot, Lowes, Sears and Best Buy, all year round. You never have to wait for an appliance sale with our year-round scratch and dent pricing! Either come in and browse our two St Louis appliance stores, browse our web site or call and talk to a representative who will be happy to help you find the home appliances that meet your needs. We are one of the largest scratch and dent appliance stores in St. Louis with tractor trailers arriving weekly. It is impossible for us to post our entire inventory online due to the high turnover. If you have an appliance in mind please let us know what appliances you are shopping for and we will help you find the right product at the right price. Now you can shop at either of the scratch and dent appliance store locations 7 days a week or browse online anytime to find scratch and dent appliances at a discount of 20% to 50%. You will find hundreds of models on display, and the selection changes constantly as appliances arrive by the truckload. If you don't see the one you're looking for, let us know and we can help you find what you need - it could arrive any time. Check with us often as we receive limited quantities of each model. Buying scratch and dent appliances in St Louis can save you a lot of money. Home appliances can be a large investment and sometimes you need to replace yours unexpectedly. We understand that sometimes it just isn't in the budget to buy a new high-end appliance at retail prices. That's why we offer a huge inventory of scratch and dent appliance to our neighbors in St. Louis. In fact, shopping our scratch and dent inventory can enable you to get a better appliance at a lower price than shopping at retail appliance stores. 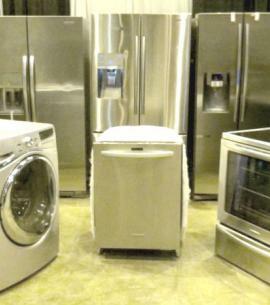 At our St. Louis appliance stores, you don't need to settle for a cheap refrigerator, stove, dishwasher, or laundry set; you can get high-end home appliances, even stainless steel appliances at huge discounts - all because of a little scratch and dent. We have scratch and dent refrigerators starting at $399 and scratch and dent appliances starting at $125. Everything we sell comes with a 90-day warranty with extended warranties available. We inspect and refurbish everything before putting it on our showroom floors so you can shop with confidence. We provide delivery and haul-away services and financing is available. While you are shopping our appliance store for used appliances, consider our other discount appliances. You always save on name-brand premium products, both new and used. We buy discount appliances that are discontinued models, open-box, returns or overstocks. All are new, but with damaged shipping containers and sometimes cosmetic damage, at extremely reduced pricing. We carry limited supplies of many major brands - manufacturers like Kitchenaid, Samsung, GE, Whirlpool, LG, Maytag, and Jenn Air. We quality inspect everything we sell to verify condition before we put it on our appliance showroom floor. We offer these cheap new appliances to our customers for steeply reduced prices, with discounts of 20-50% of the retail prices.